My friend and I recently tried some salads from a 'fast food salad' shop in one of the food courts at Highpoint. The two salads that I had for lunch were soooo yummy. I had the Moroccan Roast Vegetable Salad as well as the Pumpkin, Feta and Beetroot Salad. 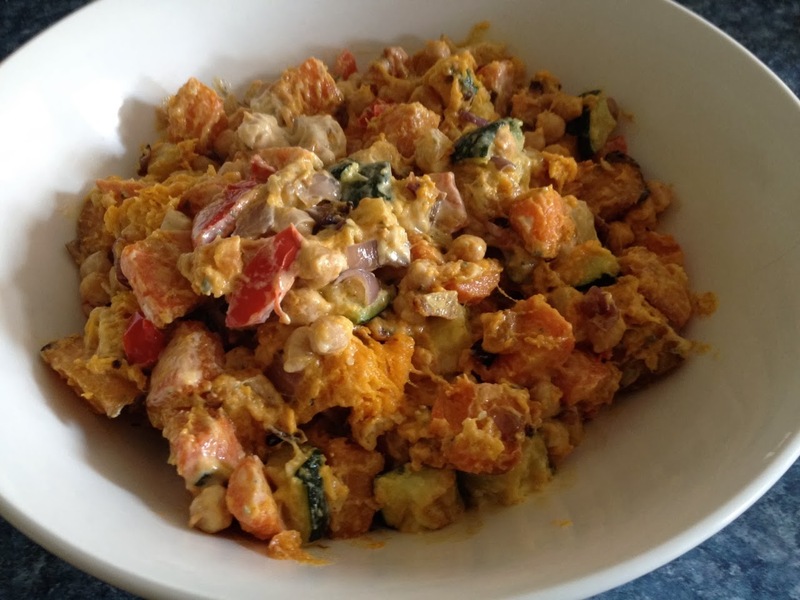 As soon as When I got home I googled it and found a few different versions of salads with the same name - so I decided to make up my own version and with the hope that it will be as tasty as the one at that I had for lunch. 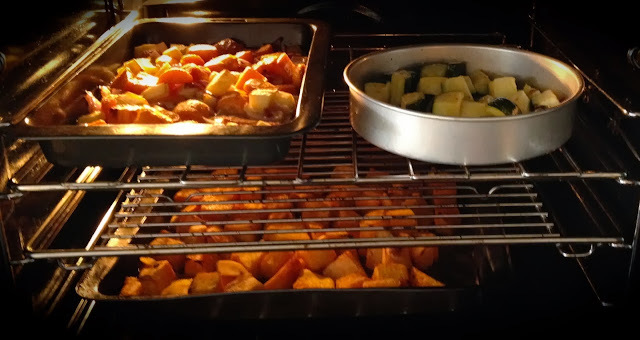 To roast the red capsicum I followed this recipe (as I hadn't roasted either before). Capsicum smells divine after it's roasted and I was sooo tempted to just eat all the capsicum and not put it in the salad at all. Roast zucchini recipe here (but I didn't use the garlic). Cut other vegetables into bite size chunks and roast at 180. I like to put a big bit of butter on the vegies when they've got about 15 mins to go and stir it through. Turn up the heat to 220 for the last 5 to 10 mins to get the crispy, yummy caramelised burnt bits. I roasted the red onion (I chopped it up first) for about 15 mins, but you could leave it uncooked. Mix tahini, lemon juice, cumin and yoghurt together. Add all vegies to a big salad bowl and add dressing. I only used one can of chickpeas, but next time I'll use two cans and perhaps put some garlic in the dressing too. It didn't taste like the one I had, but it is still really yummy - I just have to try to wait till it's tea time to eat it.